A maiden media contest on population and development journalism has been launched in Accra with a call on government to prioritize funding for Sexual and Reproductive Health and Rights (SRHR) education in the country. This, according to the Executive Director of the National Population Council (NPC), Dr Leticia Adelaide Appiah, would help to prevent unintended pregnancies and improve maternal and child health in the country. “We can either invest in reproductive health information and services and reap the dividends or ignore it and continue to bear the expenditure of unintended pregnancies, both in the short and long terms,” she said. Speaking at the launch of the maiden population and development media awards, Dr Appiah said 90 per cent of all adolescent pregnancies in 2017 ended up in unsafe abortions. According to her, such pregnancies and abortions could have been prevented if the victims had access to information on SRHR. “Factors accounting for these outcomes are multiple, and include inadequate access to information on SRHR, social stigmatization against persons who access SRHR services such as family planning particularly among adolescents,” Dr Appiah stated. From left: Minister for Information, Mr Kojo Oppong Nkrumah; Executive Director of the National Population Council (NPC), Dr Leticia Adelaide Appiah, and Executive Director of the Planned Parenthood Association of Ghana (PPAG), Mrs. Abena Acheampong. Dr Appiah said the submissions would be opened from December 1, this year, to June 30, 2019, and that the awards would be held in July, 2019 to climax the World Population Day. She, therefore, encouraged journalists and media practitioners to report more on population and SRHR issues to enable them to win any of the categories in the contest. 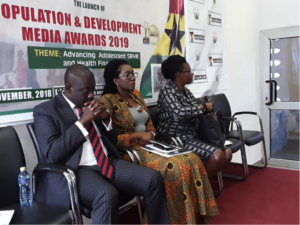 The Executive Director of the Planned Parenthood Association of Ghana (PPAG), Mrs. Abena Acheampong, said the awards would serve as a motivation to journalists to report on population and SRHR issues in the country. According to her, issues on population and SRHR had been underreported in the country probably due to the lack of information and understanding on it by journalists and media practitioners. She said issues on population and SRHR affected every aspect of the country’s development, hence the need to educate the public on them. Mrs. Acheampong noted that PPAG would continue to partner NPC and other relevant stakeholders to disseminate information and educate the Ghanaian public on issues on population and SRHR. 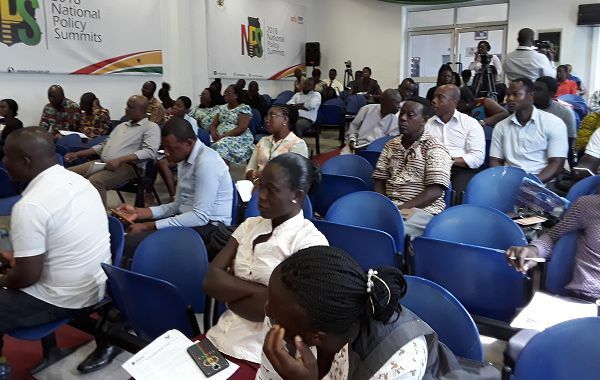 The Minister for Information, Mr. Kojo Oppong Nkrumah, who officially launched the awards scheme, said population issues were of great importance to the government, as government programmes and policies were all tied to the population of the country. He, therefore, urged the media to continue to serve as agents of development by highlighting issues that affected the very existence of the citizenry. “The best journalist is the one who looks out for stories that the society must hear,” he said, pledging the support of the government towards the organisation of the awards.